Description: We develop a general technique for proving convergence of repeated quantum interactions to the solution of a quantum stochastic differential equation. The wide applicability of the method is illustrated in a variety of examples. Our main theorem, which is based on the Trotter–Kato theorem, is not restricted to a specific noise model and does not require boundedness of the limit coefficients. Description: We consider the system = a(z−a1x3−a2x2−bx), = −z, = −b1x+y+b2z, where a and b are parameters and b1 = 7/10, b2 = 6/25, a1 = 44/3, and a2 = 41/2. We analyze the existence of local and global analytic first integrals. Description: The renormalization group (RG) method for differential equations is one of the perturbation methods for obtaining approximate solutions. 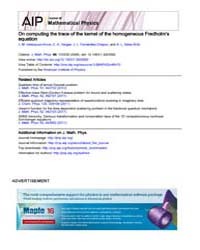 This article shows that the RG method is effectual for obtaining an approximate center manifold and an approximate flow on it when applied to equations having a center manifold. Description: The concept of integrable boundary conditions is applied to hydrodynamic type systems. Examples of such boundary conditions for dispersionless Toda systems are obtained. The close relation of integrable boundary conditions with integrable reductions in multifield systems is observed. The problem of consistency of boundary conditions with the Hamiltonian formulation is discussed. Examples of Hamiltonian integrable hydrodynamic type systems on a segment and a semiline are presented.